Some may say that this image captures the spirit of Jersey Airlines. The year: 1960. The place: Jersey. 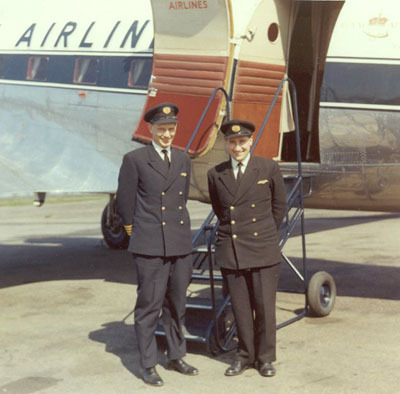 Captain Bernard Gardiner (left) and First Officer Peter Self stand alongside a Dakota, gleaming in the summer sun. The blue livery on the fuselage and the steps speaks of style. Through the open door of the aeroplane we can see the red plush of the interior trim, curtains at the windows. And the smiles on the faces of the pilots, captured in a happy snap by Jo Reader, say much about the airline they worked for and the service they gave to thousands of passengers over the years.